1955 Advance #8727 vintage sewing pattern, misses' slim wiggle dress, plus size 18. 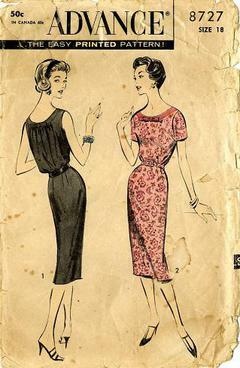 (1) Sleeveless dress, yoked neckline has applied self bows at oval front, scoop back. Easy fitted bodice front has blouson back. Slim skirt...low back pleat. Novelty contour belt. (2) Short sleeves, contrast yoke, bows. One edge of some folded pieces are a little fragile, but not torn. Extra care needed in opening.